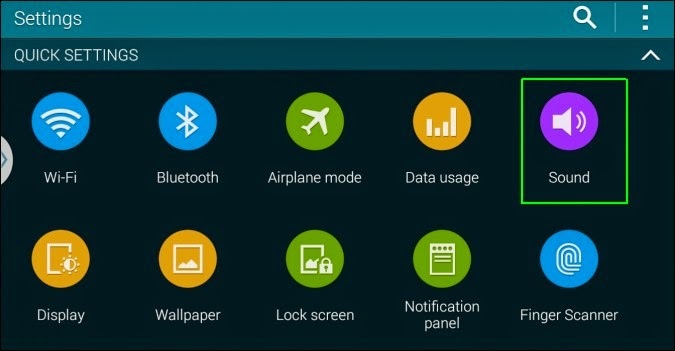 The first moment you turn your Galaxy S5 on and start navigating through its user interface and clicking on the icons, you will hear something like a "bloop" noise. While you may find these sounds cute at first, later on you will tend to become annoyed with them. If in case you're already tired of hearing such "blooping" sounds on your phone, then why not disable the feature now? You may refer to this content as we walk you through the entire process of disabling touch and unlock sounds on your Galaxy S5. 1. Start by selecting Sound from the Settings menu. 2. Toggle "Touch Sounds" option to Off if it is checked. Doing so will remove the check on the box, thus disabling or turning the feature off. 3. Toggle "Screen Lock Sound" option to Off if it is checked. Doing so will remove the check on the box, thus disabling or turning the feature off. 4. If you don't want your Galaxy S5 to make some noises while you are entering a phone number to call, uncheck the “Dialing Keypad Tone” option. That's it! Try to navigate your phone's UI and click on certain icons and hear no more "bloops" as you do so.